Grow Morel Mushrooms in your yard. Start any time your soil is workable - Spring, Summer, Fall and even Winter (in areas with a mild climate). Create an earth friendly, sustainable, organic, outdoor Morel Mushroom garden & grow morels in your backyard. 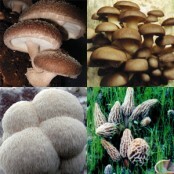 We provide Guaranteed* to produce spawn (seed), of our unique morel strains which will allow you to grow pounds morels. Customers have found morels in their Habitats 24 years after they were established! Complete instructions for your Morel Habitat are included. Use spawn immediately or store for up to six months. Every spring avid morel hunters flock to fields and forests across the United States in searching for the delectable morel mushroom. They drive and hike for hours, wade through poison oak or ticks in search of the highly elusive morel. Why not grow morels in a backyard garden? CREATE A MOREL MUSHROOM GARDEN IN YOUR BACK YARD AND THIS KIT WILL BE THERE GROWING FOR YOUR CHILDREN TO ENJOY! "In addition to what you need to grow other genera, they sell a morel "habitat kit", and I actually know someone who had good success with it." April, 2018: Now have at least 10 big morels and are finding more all around beyond the area they planted! They are 6 inches tall and beautiful! Jennifer San Juan Island in Washington. The MOREL HABITAT KIT TM was developed so everyone could enjoy growing their own morels in their own backyard and have a personal supply of fresh morel mushrooms to eat each spring. The Morel Habitat Kit is not designed for commercial cultivation of morel mushrooms, but it will supply an individual with pounds of morel mushrooms in a garden area as small as 4 - 5 sq. ft. MOREL HABITATS are perennial and may be started any time your soil is workable - Spring, Summer, Fall and even Winter in areas with a mild climate. American Morel Habitats may be started in any type of soil and have produced morel mushrooms in all areas of the North America that have a definite transition from winter to spring. We provide spawn (seed) which contains our unique morel mushroom strains and will allow you to seed a back yard MOREL HABITAT which can produce pounds of morels each year in a properly maintained four foot by four foot area. Typically, only a few pounds of morel mushrooms are found the first spring it produces; the next year provides the best crops, and crops may tend to get smaller in subsequent years; it may take two seasons to start producing. The MOREL HABITAT is ecologically sound and actually allows you to improve the environment by recycling biodegradable material instead of adding it to already overburdened land and sea sites. You may already have all the materials necessary to create a MOREL HABITAT and cultivate morels in your own backyard garden, and everybody with a yard has most of the materials needed to create and maintain the MOREL HABITAT. Complete instructions for preparing and maintaining your MOREL HABITAT are included. Morel spawn may be held in your refrigerator for six months.